Yesterday was a good day for Richard Elliot-Square and William David Thomas. These gentlemen have made respectively $1.5 million and $300 thousand in just about four months. They are also the CEO and CFO of APS's current pump - TagLikeMe Corp. (PINK:TAGG, TAGG message board). The aforementioned amounts are the change in the price of TAGG shares the executives hold since they bought them in June. Yesterday, TAGG closed up 24.11% at $0.1565, although there was no sound reason for such a move, other than the ongoing pump. Back in June, Mr. Elliot-Square and Mr. Thomas bought TAGG shares at $0.03 for $60 thousand and $12 thousand respectively. About a month later the company executed a forward split increasing the number of shares held by the execs fivefold. Then came the pump. At $0.1565 the market cap of TAGG is close to $52 million. At the same time, all the company has is a relatively new social media website (which seems to be down at this time,) negligible current assets of about $16 thousand, and current liabilities close to $1 million. The numbers are from TAGG's quarterly report for the period ended June 30. Investors may have a better idea of what the company is worth if they get a report for Q3, however, the company hasn't seen fit to file it so far. Despite the fact that TAGG hasn't made a dime and has been silent since last Wednesday, the pumpers at Awesome Penny Stocks (APS) are hard at work throwing around baseless ideas of a takeover by a big company. They give the acquisitions of Virtue, Buddy Media and Wildfire as examples, which could be remotely relevant if TAGG was anywhere near the category of the aforementioned companies. Before Virtue was acquired by Oracle it had already become an established company which was reportedly going to generate close to $100 million in revenues for 2012. Buddy Media's revenues haven't been disclosed, but from what Salesforce has revealed, the acquired company would have been on track to make about $20 million in about 4 months. 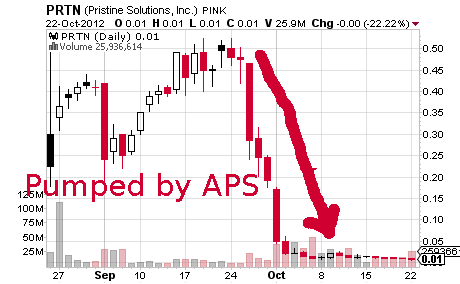 It's also worth noting what has been the fate of the previous picks of APS like Pristine Solutions, Inc. (PINK:PRTN), North Springs Resources Corp. (PINK:NSRSE), Amwest Imaging, Inc. (PINK:AMWI) etc. While they span different sectors they all shared a similar pattern after the pump was done - dropping more than 90%, obliterating the investments of naive traders. The "buyer beware" sign on TAGG's page at OTCMarkets.com is there for a reason. One way for Mr. Elliot-Square and Mr. Thomas to actually get their money would be to dump their shares. If you don't want to get burned, always do your due diligence, especially when the stock is being promoted. See the video hedge fund manager Carl Azbell made when he physically went to the TagLikeMe headquarters, you'll be AMAZED!! the site just worked for me?? It might be a scam like all lots of businesses, so get in on the right side of the scam/equation. what are your overall views on PRTN do you think it will pump again and how soon ? maybe when they start making roof shingles. Its not easy to determine weather or not a stock is done pumping before it dumps and trying to sell out while it tanks in almost impossible so i go by MMM move in,Make money , move out. even if you only walk with a little its better than walking with a loss. Please keep up with the trash comments. Every time you post something the stock goes up!! As of today TAGG has 235 users.....I'm pretty sure this figure is correct. And go to the last page of results. You can refine it further by clicking the results on the left for a particular timeline. For instance 5 new people joined this past week.